Heatstroke: If the dwarf cannot withdraw into the shade on a hot summer day, heatstroke can result. If the cage is outside, check the movement of the sun to be sure it is not sitting in the blaz­ing sun. Don’t transport your rabbit in an over­heated car or the heat-sensitive animal could suffer heatstroke. Heatstroke symptoms are unmistakable: The dwarf lies listlessly in the corner, breathes shallowly with quivering body and flaring nostrils. The mucous membranes are bluish. Move the animal into a cool room at once. Try to lower the rabbit’s body temperature by laying a damp, cool cloth over the head and body. Don’t use ice-cold water. To support circulation, administer one teaspoon-ful of freshly brewed coffee made from ground coffee beans. Don’t use instant coffee. If the ani­mal improves, let it run free in a cool, shady place. 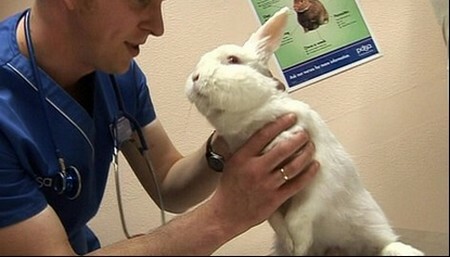 Terror shock: Imagine this scene in a veterinar­ian’s waiting room: A dwarf rabbit’s owner has brought his pet in a wicker basket open on top. A large dog suddenly comes in with his master and sniffs at the basket. The dwarf springs out of the basket in one great leap, squealing loudly, and tries to find cover in the room, then presses him­self flat on the floor and remains motionless as if paralyzed by fear. His eyes seem to swell right out of his head and his little body heaves. The rabbit is terrified, for the dog is his natural enemy. In such a situation, the rabbit’s heart can easily stop beating and it dies of fright. Depending on how shy and fearful a dwarf rabbit is, even the unfamiliar noise of a vacuum cleaner or a low-flying airplane can put it into a panic and lead to terror shock. If this should happen, approach the animal slowly and talk to it in a reassuring voice. Grasp the dwarf quickly and securely by the loose back skin behind the ears. Immediately put it into a darkened container, preferably a transport box. Provide a room temperature of 75°F (24°C) and absolute calm. As medicine in acute terror shock, the Bach Flower Therapy mixture Rescue Drops can help. Put two drops of the essence in one tea­spoon of water through the side of the mouth every 20 minutes. Other homeopathic remedies include: arnica C 30, but only two drops in one teaspoon of water given once. It is easier to do if you administer the medicine with a disposable syringe (without a cannula) or pipette (both avail­able in the pharmacy).